If September 11, 2001 and December 7, 1941 are dates that are unforgettable dates in American History, then June 10, 2016 is a day in sports that will not likely be forgotten. This is the day that Muhammad Ali's Funeral took place as "The Greatest Of All Time" was laid to rest. 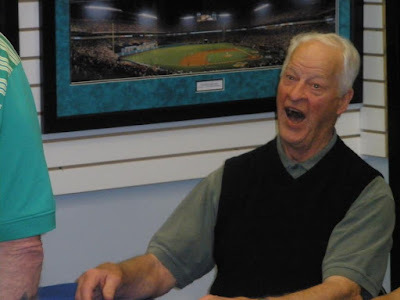 When I read on Facebook that My Childhood Idol Gordie Howe died at 9:35 AM, I couldn't believe what I was seeing. But when I heard it on Mike and Mike In The Morning at 9:52 AM that Howe passed away, then the news stung even more. Mike and Mike rarely talk about Hockey, but ESPN 2's producers did a good job compiling as much information in a 90 second time frame. It's amazing that Ali and Howe, who are on My Mt. Rushmore of Idols would be memorialized on June 10, 2016. During the past week, The Sports World has been hit by The Death Bug. We've seen the losses of Philadelphia 76'ers Assistant Coach and former NBA Player Sean Rooks, Kimbo Slice of Mixed Martial Arts along with legendary Michigan State Hockey Coach Ron Mason pass away. Obviously, Howe's death hits me real hard. I went to school with his son Murray at McIntyre Elementary School in Southfield, MI. My Cousin Robin Leshman went to school with Howe's daughter Cathy. It would be easy to write this tribute with all of Howe's records, but there wouldn't be enough storage space or memory on the website. Every Hockey Fan knows about The Gordie Howe Hat Trick consisting of a Goal, Assist and a Fight. In Howe's 26 NHL Seasons, he played in 1,767 games, amassed 801 goals, 1,049 assists, and 1,685 penalty minutes. He won four Stanley Cups, six Hart Trophies, six Art Ross Trophies and was inducted into The Hockey Hall Of Fame in 1972. He also played in 23 All-Star Games. Howe is the only player to have ever played Professional Hockey in six decades. The statistics I've mentioned don't even include the time Mr. Hockey spent playing for the United States Hockey League's Omaha Knights, The World Hockey Association's (WHA's) Houston Aeros, and New England/Hartford Whalers, in addition to the Detroit Vipers of the International Hockey League, which played at The Palace of Auburn Hills. The Hartford Whalers played in the NHL. According to Murray Howe, the only city that Mr. Hockey was ever booed in was Cleveland, Ohio when Gordie played in the WHA. Howe is described as the No.1 All-Time player by legendary Red Wings Hall of Fame Coach Scotty Bowman. Name me a North American athlete that will have a bridge in his honor connecting two countries, the United States and Canada. A bridge over the Detroit River connecting Detroit to Windsor, Ontario., will be named "The Gordie Howe International Bridge" is set for completion in 2020. At least Mr. Hockey was alive to see this honor named after him. Like Ali, there was no shortage of memories with Mr. Hockey. I saw him play in an All-Star Game on February 5, 1980 at The Joe Louis Arena (JLA). 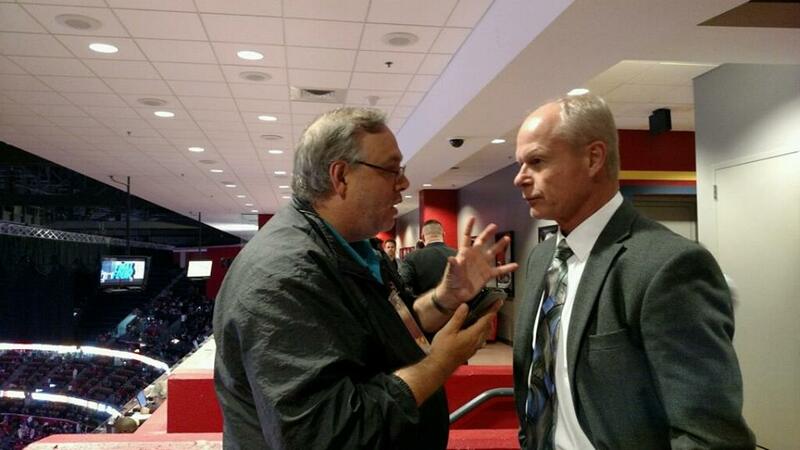 Howe made his rounds around the Metro-Detroit Sports Scene. 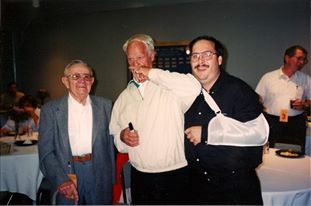 We took a picture at the Pontiac Silverdome in the dining area, My shoulder was in a sling due to a torn rotator cuff, but I enjoyed being "Elbowed" by Mr. Hockey as Lions legendary Announcer Bob Reynolds looked on. On the ice, Howe's opponents took many of these elbows all over their body and head; and they must have hurt. Ali was known for "Fists To The Jaw" and Howe specialized in "Elbows." Howe always said that Hockey is a Mans Game. My pictures with both of these icons are worth more than a 1000 words. During my time as a resident of Metro-Detroit, I got to know Howe's publicity people. They were kind enough to send me two autographed photos of Howe which are in My Office in Deerfield Beach, FL. My path crossed again with Mr. Hockey in 2011 when we took a couple photos together. We talked about Hockey for a few minutes, and he remembered me writing mentions of him in Stories for The Detroit Monitor, then shook hands as he signed autographs for a Sports Memorabilia Store in Coral Springs, FL. Gordie seemed like he was in decent health at the time. Yet, as we get older, our bodies do break down, and Howe was diagnosed with dementia and suffered strokes. Mrs. Hockey Colleen Howe passed away in 2009 at the age of 76 after a long battle with Pick's Disease. Yet. Mr. Hockey had an Iron Ticker and despite these medical issues, he would continue to fight tougher than his rivals on the ice. Howe had Stem Cell Surgery in Tijuana, Mexico., and continued to battle to the end. maximize his days in his later years. But to realize what an incredible family he had, Mark, Marty and Cathy would all take turns caring for their father around the country. Without the Stem Cell Treatments in Mexico, we should have been paying tribute to Howe during the past 18 months. We owe an assist to the Mexican doctors for keeping our icon longer than we expected too. I admire Murray for not donating Gordie's brain for research. His father lived until he was 88-years old and there is no reason to add another reason about his death. Closure is a good thing. I wish I could have been at JLA for Howe's Public Visitation. JLA has housed four Stanley Cups, an All-Star Game and now this event as we head into the stadiums' final year. But at least I have This Platform to pay My Respects. I have four great photos as well as the ability to communicate with My Followers and Friends on Facebook and Twitter. And a whole lot more memories. Wayne "The Great One" Gretzky said he felt that Howe is "The Greatest Hockey Player of All-Time." I agree with Wayne. I also believe that if Gretzky was playing in Howe's Era, he wouldn't have broken as many as Mr. Hockey's records. He would have gotten battered around during The "Original Six" ERA. Gretzky probably would have amassed more penalty minutes and had a few more fights to protect himself. But that topic will be discussed at a later date. If the NHL retired Gretzky's No.99 throughout the league, then the league should do the same with No.9. I'm glad that Gretzky is pushing the NHL to do this and I have a feeling it will get done. The Red Wings New Stadium should have Howe's name attached to it. But I can't see that happening in this commercial age. I hope Red Wings Owner Mike Illitch proves me wrong because after the Ernie Harwell firing controversy years ago by previous ownership, he allowed this broadcasting icon to retire on his own terms. Illitch cleaned up a major public relations mess! It was unfortunate that Howe died during the Stanley Cup Finals. I hope all NHL teams find a way to make the 2016-17 Season a Tribute Year for Mr. Hockey. But I'll say about Gordie Howe the same thing that I said about Muhammad Ali. I Love You Mr. Hockey and Rest In Peace rejoining your lovely Wife Colleen. Thanks for giving me some Unforgettable Memories that I've enjoyed and will last during the rest of My Lifetime! I'll never forget you and nor will fans in Metro-Detroit, a place that I'm very proud to call My Hometown. You were and always will be a legendary giant, icon and there will never be enough words in Webster's Dictionary to describe the impact on us you created. If it weren't for You Mr. Hockey and the Red Wings 25-year consecutive playoff run, it would be tough to call Detroit "Hockeytown." 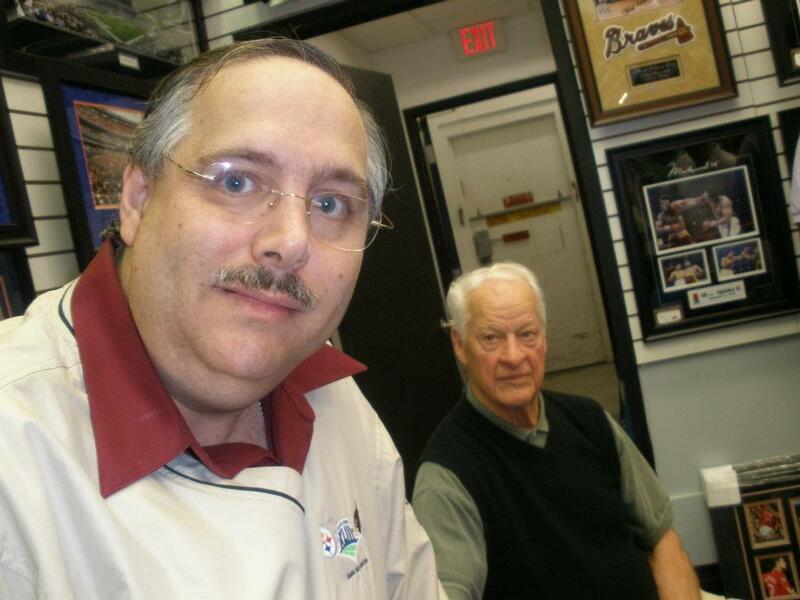 There is no doubt of the legendary sports figures in Detroit and Gordie Howe is at the top of my list. My Top 10 includes: 1. Howe 2. 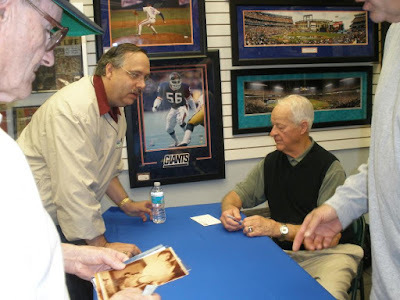 Al Kaline (Mr. Tiger) 3. Ty Cobb 4. Barry Sanders 5. Isiah Thomas 6. Steve Yzerman 7. Hank Greenberg 8. Joe Louis 9. Dave Bing 10. Miguel Cabrera. God bless in Heaven, Mr. Hockey and once again, thanks for the memories! You'll be missed forever! But The Hockey and Sports World will Celebrate Your Death! You and Muhammad Ali are legends and now are linked to June 10, 2016. On Friday June 10, 2016, Muhammad Ali was laid to rest in his hometown of Louisville, KY at The Cave Hill Cemetery. The "Greatest of All Time" will Rest In Peace with Kentucky Fried Chicken Founder Colonel Harland Sanders. On Saturday June 4, 2016, the day after Ali died, I posted My Memorable 1982 photo with The Champ on Facebook. I was touched, overwhelmed, and appreciative to My 90 Plus Facebook Friends with their acknowledgement of this incredible memory with Ali. I feel extremely lucky to have spent two days with Ali as he trained for a charity fight at the Allen Park Gym in North Miami Beach, FL., in 1982. My Editor Dan Bluesten of The Hallandale Digest came up with a neat headline for my story "Is Ali On The Comeback Trail." 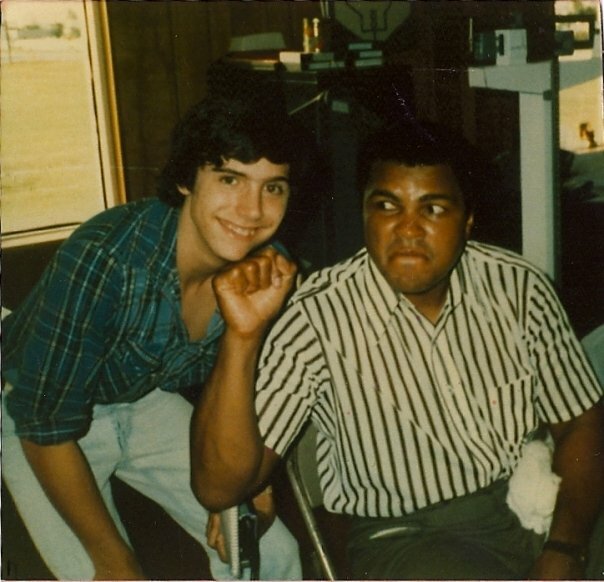 I had some great assignments with the Digest, but my time with Ali was No. 1. I took this photo with him and also took My Aunt Pearl Cullen to visit "The Champ." Ali gave her a hug she'd never forget. On June 4, 2016, My Cousin and Pearl's daughter Cindy Cullen Spyke called me to see if I was doing ok following Ali's death. She knew that Ali meant a lot to me. As I look back at my time with Ali, when we talked, he began to develop slurred speech as Parkinson's Disease symptoms began to appear. Although Ali didn't have as many words, this photo was worth a 1000 words. But to me, just being with "The Champ" overshadowed any speech issues. However, when I asked Muhammad about his win over Heavyweight Champion George Foreman on October 30, 1974, he didn't mince words about what transpired of what happened in "The Rumble In The Jungle" when he described his famous "Rope A Dope" Strategy. "I new George Foreman never went deep into fights so I just wanted him to punch himself out," Ali said. "There was no filler station for him to gas up." Indeed, there wasn't and there would never be a rematch. Ali sent Foreman to a depressed state where George had a taste of humble pie. 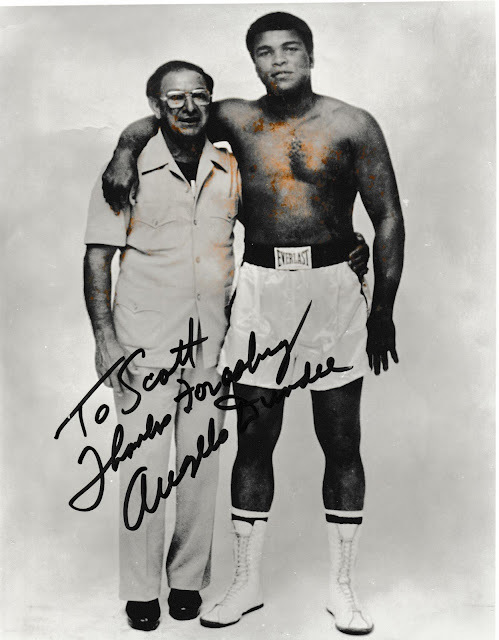 The person behind my meeting Ali was his Trainer Angelo Dundee pictured with Ali below. I used to cover a lot of boxing for The Digest. The events were held at the Diplomat Hotel in Hollywood, Florida and The War Memorial Auditorium in Fort Lauderdale. I became great friends with Dundee as well as his brother Chris Dundee and boxing historian Hank Kaplan. Dundee contacted me when Sugar Ray Leonard came to town and I wrote a story on him as well. To even have the platform to be able to talk about Ali is incredible! I have no desire to ever get into any political discussions about his viewpoints. Ali was a True World Champion because he fought in London, England, The Philippines, and South Africa. He never avoided a top opponent because everyone deserved a shot at the title. I truly respect his decision to not want to fight in The Vietnam War because this conflict should have never happened in the first place. I often wonder what the pay-per-view costs would be with his three fights with Joe Frazier and George Foreman. If Mike Tyson, Evander Holyfield and Floyd Mayweather would get $50 for a fight, Ali's events could be worth up to $100. Ali was an Albert Einstein in the ring because he out classed and out smarted his opponents. Boxing was a Chess Match for Ali because he could mix knockouts with going the distance if he had to. Before the Foreman fight, Angelo Dundee never knew about his "Rope A Dope" Strategy, as he had the ropes loosened before the fight. It's hard to not respect a person like this. Leonard used to do the same and that's why he won World Championships. When I hear stories that Ali never refused autographs to fans, and always took pictures when he could, this was incredible! Ali was a great promoter of his fights and his Actions Spoke Louder Than His Words. He actually could be considered an inventor of "Trash Talking" because of his ability to play mind games with his opponents. While it's sad to see Ali is no longer with us, at least he can now rest in peace. In recent years, Ali experienced numerous health issues. Now there is no more suffering. Back in 2002, I did have a chance to see Ali again after a Phoenix Suns contest versus the Detroit Pistons at the America West Arena in Arizona. I walked up to Ali, he smiled and shook my hand. There would be no photo opportunities in the Suns locker room to avoid a potential violation of Media Rules listed on the back of our credentials. Nonetheless, it was still an incredible feeling because the first time I met him, I was just 2 1/2 years into My Media Career and was 19-years old. During our second meeting in Phoenix, I was in my 23rd year in The Media, more filled out at the age of 39. By this time, Ali's speech was much worse and he was trembling. But I didn't care because it was great seeing him again. During the past 10 days on Facebook, I was pleased to be able to see some of My Friends share their photos and stories with "The Greatest." It was the thrill of a lifetime to have met such an iconic person. My mother posted a touching comment on Facebook telling me how proud she was of me as a Sports Writer, and she has My Ali photo at her home. But for all of the World Championships he won, in addition to the 1960 Olympic Gold Medal, seeing Ali light the 1996 Olympic Torch in Atlanta was truly breath taking. Ali's legacy and passing should be viewed as a Celebration that should bring young and old generations together. With Google and You-Tube, we're always a click away from learning about a person or watching their great accomplishments. I must have watched the Ali-Foreman fight a few times the day after he died. All I can say is I'm thankful that I had the chance to see him on two occasions. Being in Sports Media for 37-years, has allowed me to meet tons of incredible people. I often wonder how many other photos I'd have if I had a camera phone early in my career. Thankfully, I still have great photos that I'm thankful for, in addition to many great interviews on tape for those that are interested. I may not be a wealthy man financially, but I'm rich in memories and experiences with plenty of stories. There is no question that Ali is at the top of My List of people I've ever met. All I can say Muhammad is that I Love You Very Much and Thanks for All The Memories We Spent Together. Rest In Peace Champ Because You are The Greatest of All Time!! When I come to Louisville, KY., I will be visiting You at The Cave Hill Cemetery! !